While most of what I talk about here is related to open source technologies that reside in the solution portfolio of Red Hat, I'd like to think it's because working with good technology is why you read this content. This article is a bit of a plug for something directly related to the business of working with Red Hat technologies and customers. It's about partnering with Red Hat as an organization to further expand your reach and provide your developers / consultants / architects with the chance to work with all of these open source technologies. Last week, I was invited to present for the Red Hat Partner Community Meetup in the Netherlands. This is a very unique group of companies known as Premier Partners that can deliver IT services for customers using open source technologies supported by Red Hat. My talk was about giving these partners a preview on the application development product portfolio, such as what is coming, timelines and what's driving future direction in the products. Here's a peek at the lead slide, as unless you were in attendance, that's all you're going to get. The question you might be asking yourself is, "How can I get in on sessions like this?" 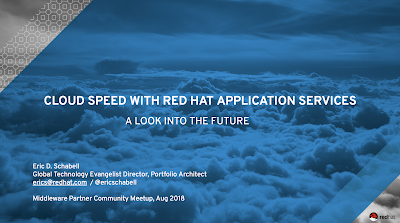 That's not as hard as you think, but it does involve you getting in touch about the depth of collaboration with Red Hat, how to get your companies services mentioned, and how to accelerate your open source solutions. Hope to welcome you and your teams soon as Red Hat Partners!